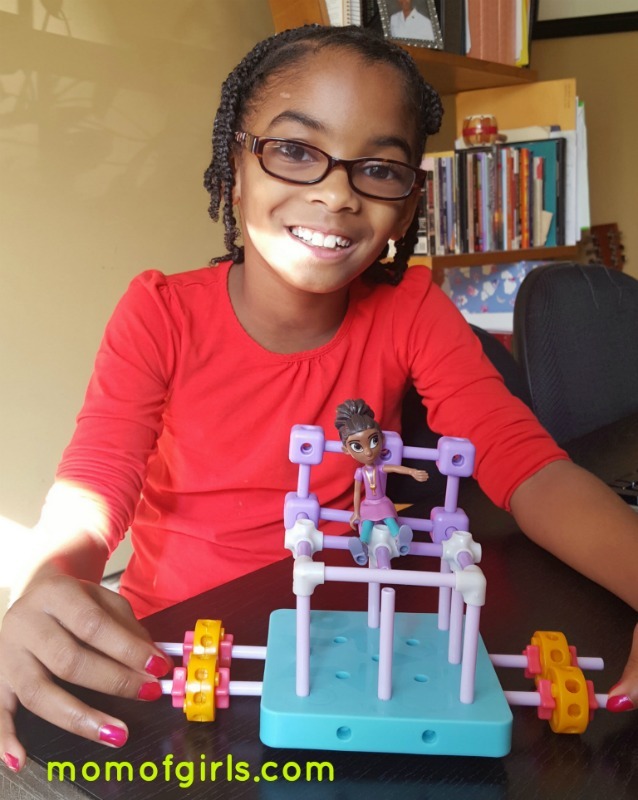 GoldieBlox has a great mission – to inspire a future generation of female engineers. After reviewing their site, learning about the characters and seeing the toy sets offered, I decided to gift my girls the GoldieBlox and the Builder’s Survival Kit. They are in elementary school, and I couldn’t wait to see their inventions using the survival kit. Here’s a brief about the survival kit. 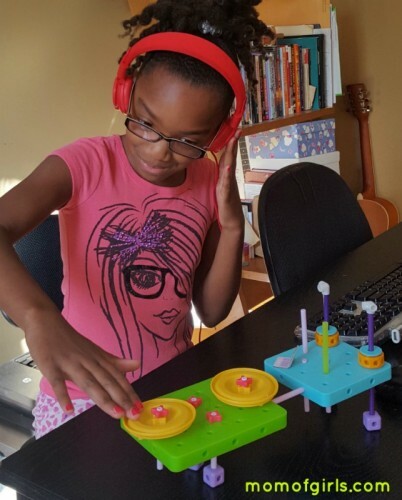 It comes with a little bit of everything, including over 190 pieces and a book of ideas cleverly titled, “Goldie’s Diary of Inventions.” The pieces are colorful and simple, taking away any intimidation from using it. There are platforms, sticks of various heights, connectors, strings, rolling pieces and more. Plus, most of the pieces are plastic, so your girls don’t have to worry about breaking them. 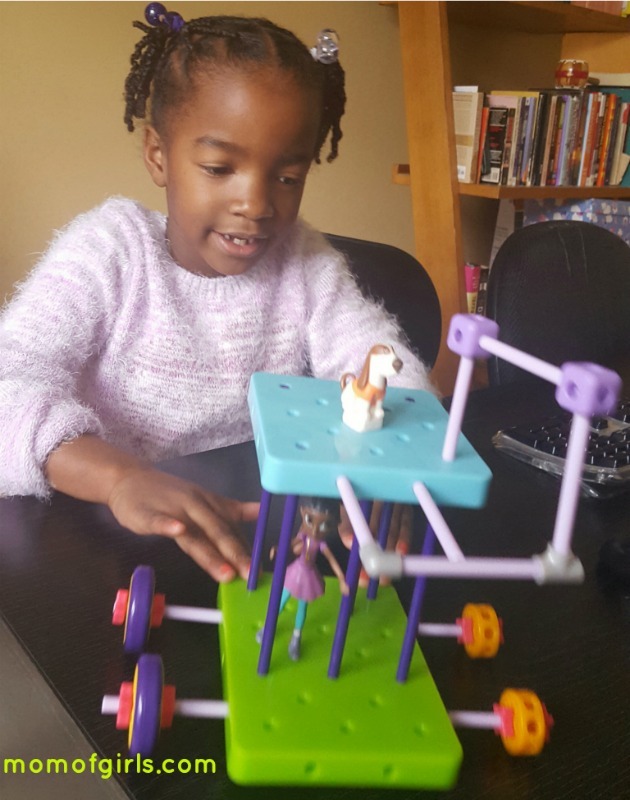 It really is a great STEM (Science Technology Engineering Math) toy that encourages creativity and confidence in building. The first day they used the diary a lot to understand how the pieces worked and to get comfortable with the set. Then they started coming up with their own ideas. The only issue we’ve had is having enough pieces for them to play at the same time and create different things, without vying for the same pieces. If you’re buying the survival kit for more than one child to use at a time, consider buying a couple of the expansion packs. Now for the good better part. If you’re interested in buying GoldieBlox, here’s a discount link. Use it and you should get 20% off of your purchase and I’ll get 20% off of my next purchase. And I would love to know what you think of your GoldieBlox set. p.s. I also purchased Ruby’s Sky-High Cable Car. My oldest assembled most of it, with some help from her sisters and was so proud of her work. I’ll definitely buy some of the other sets. These sound like so much fun. My kids would definitely get a kick out of them! Yes, my girls absolutely love them!